I love it when a great story idea grips me. Often, it starts with one small thing…a sound or a flash image. Sometimes I’ll get both, something utterly sensory that sends a thrill through me, like the ominous flutter of a plastic grocery bag caught in a tree branch on a windy day. Immediately I’ll start to “know” things. There’s water nearby. A dead body lays in the reeds, a teenage girl. A boy with find her, one who has lost the ability to speak. Snippets trickle in, clues of the story ahead, of what is to come. Excitement builds. I’m sure it’s a similar process for many of you. There’s always the temptation to rush head first down the rabbit hole, to write that first scene, the one where the mute boy discovers the girl’s body. To leap in and describe it all—how the light dapples the water, the warmth of the sun, the paleness of flesh devoid of life. But the truth is, I’m not ready to write. I shouldn’t write. Because even if I know exactly how the scene will go, what the male hero will do, how he will drag the body onto the bank, hoping, praying the girl is still alive, I don’t know anything yet about who he really is. The protagonist is the true heart of a story. The immediate events around him—discovering a dead body, pulling it from the river—will keep a reader glued to the page at the start, but the compulsion to read on will fade if something deeper isn’t introduced. What keeps people reading isn’t intense action scenes, but rather the emotional component of the hero’s connection to what is happening, and how it affect him on the inside. Some assume that emotions are sort of standard…that this situation would make someone scared and that situation will bring them joy. But it really is so much more complex than that. Each person in real life is a complicated and unique being, shaped by their past, molded by what life had thrown their way and how they have coped with challenges, both good and bad. They have motivations for everything they do. People have fears, they have worries, and deeply embedded emotional wounds that mean certain events and situations act as triggers. These triggers may evoke much different emotional reactions (both type and intensity) than they would for someone else. People have vastly complex personalities, including flaws which have emerged as a type of “emotional armor” as a result of their hurts and fears. And while they believe these negative traits keep them from being rejected, disappointed or hurt again, they actually hold them back from becoming someone stronger, more self assured and complete. Luckily, every person also has a positive side to their personality—morals and character strengths that see them past adversity, helping them achieve their goals, build better relationships and reinforce their individual identity. The question becomes, if each of us is this complex…don’t we want to read about characters just as layered and meaningful? Of course the answer is yes, but this leads to one more question…to get to know our character in depth, where does a writer start? You’ll notice this post is peppered with links…why not follow a few to gain a deeper insight about some of these important elements of character building? Then, when you have a deeper understanding of what shapes a character, try out some of the tools below. The Reverse Backstory Tool: a visual aid to help you see how your hero’s specific attributes, flaws, emotional wound (and lie the character believes about himself), and greatest needs all tie into revealing inner motivation to achieve the outer goal. Protagonist Goal Checklist: a great Character Arc checklist that asks all the important questions regarding your hero’s pursuit of his goal. Character Profile Questionnaire: not your average height, weight, hair color type questions...instead, dig deeper into who your character is by asking probing questions about his fears, morals, secrets, emotional wounds, special skills and interests. A List of 638 Positive and Negative Character Traits: a great starting place to think about how to blend unusual traits to create a truly memorable and unique character. Character Attribute Target Tool: visualize your hero’s best qualities as they fall into the 4 categories of Positive Traits: Moral-focused, Achievement-focused, Interactive-focused and Identity-Focused, building a well-rounded hero who is capable of winning the day. Character Flaw Pyramid Tool: organize your hero’s flaws, from minor to fatal, and brainstorm how these flaws manifest through behaviors, especially when stress or fear enters the picture. 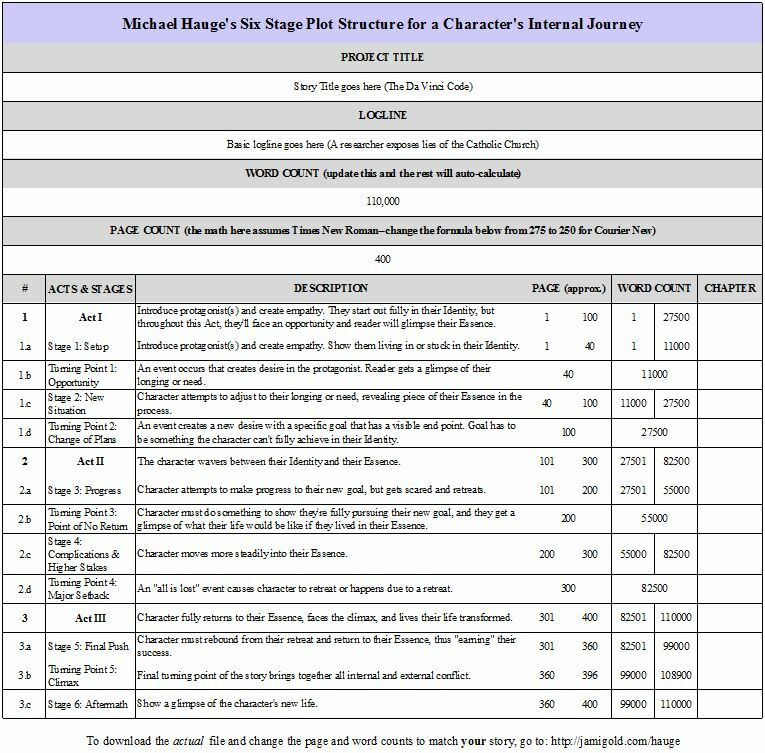 Michael Hauge’s 6 Stage Plot Structure for a Character’s Inner Journey: like a bit of structure with your Character Arc? Hit all the highlights for struggle and growth to create a satisfying internal journey. These tools and links should help you dig deep into your protagonist and his backstory, helping you to better understand what makes him tick, what his demons are, and what emotional wounds from his past they must overcome to succeed. Angela Ackerman is a writing coach and co-author of three bestselling resources, The Emotion Thesaurus: a Writer’s Guide to Character Expression, The Positive Trait Thesaurus: a Writer’s Guide to Character Attributes and The Negative Trait Thesaurus: a Writer’s Guide to Character Flaws. A proud indie author, her books are sourced by US universities and are used by novelists, screenwriters, editors and psychologists around the world. Angela can be found at the popular site, Writers Helping Writers, which specializes in building innovative tools for writers that cannot be found elsewhere. Wonderful brainstorming tips! Thank you, Angela. Thanks for hosting, Dee! Great ideas! Thanks for sharing, Angela and Dee! Hi Margo, glad this will help. have a great writing week! Excellent character insight and knowledge. I intend to investigate every link. Thank you for sharing this, Angela and Dee. Exactly what I needed today. :) I have and use all the Thesauruses almost daily. Great writing tools! Glad this came along just as you needed it--I love it when that happens to me. :) Thanks so much for giving our books a test drive, and I'm happy they make good writing partners! Fantastic post. Even without looking at who had written this, I suspected it was you, Angela! LOL, Carol! Thanks so much!